Global Pungmul Institute (GPI) is thrilled to co-host the charity concert for North Korean defectors. 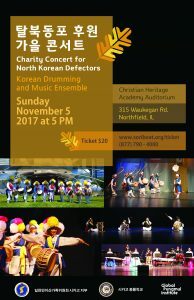 You will experience Korean drumming and music ensemble by Chicago Pungmul School, GPI’s SoriBeat and Artists in Residence, and Bulta Korean Music Ensemble. In Chicago there are about 30 North Korean defectors and they need a lot of help to settle in Chicago. Your attendance will become great help! If you can’t join us, please help us spread the word out.